Haggis, the national dish of Scotland, is now being served in the Highlands! Haggis is a rare delicacy in the United States and the newest menu item at the Lumber Baron Inn. The Inn, a Victorian mansion built in 1890 in the Potter–Highlands neighborhood, offers a range of fine dining events. Traditional Haggis calls for cuts of meat that are not accessible or considered savory in the US: a mixture of sheep’s pluck, onions, oatmeal, suet, spices and stalk, cased in a stomach lining. 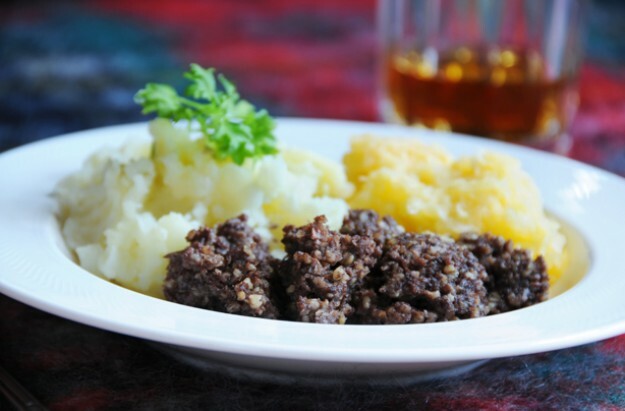 The dish is so historically popular in Scotland that it inspired famed poet Robert Burns to commemorate it with the poem “Ode to Haggis”, which is still read all over the world on Rabbie Burns Day. The Chefs at the Lumber Baron Inn have crafted a modern day version of this dish, served with tatties and neeps (turnips and potatoes), and our own savory mixture of lamb, oats and peas. “In honor of this home and its Scottish roots, and also as a chef, I felt inspired to create an authentic Haggis dish for this community”, said Joel Bryant, owner of the Inn. In addition to Haggis, The Lumber Baron Inn is adding pure Scottish Beef to the menu. Scottish beef is 90% lean, 100% grass-fed and sourced from Highland cattle that are ethically raised in the Colorado mountains. This is a unique opportunity to experience an incredible beef that is rarely served in Colorado. Haggis and Scottish beef are now available on the Wine Dinner Menu, which is served on Thursday, Friday, and Saturday nights. The menu includes three courses and suggested wine pairings. Wine Dinners are served in the mansion parlors, and are open to the public by reservation only. Cost is $45 plus wine, tax and tip. The Lumber Baron Inn also serves Sunday brunch and afternoon tea, hosts special events and weddings, facilitates corporate meetings, and offers five overnight guest suites. Details at www.lumberbaron.com. Call 303-477-8205 for reservations, and find us on social media.